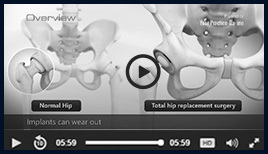 Revision hip replacement is a surgical procedure in which all or part of a previously implanted hip-joint is replaced with a new artificial hip-joint. Total hip replacement surgery is an option to relieve severe arthritis pain that limits your daily activities. During total hip replacement, the damaged cartilage and bone is removed from the hip joint and replaced with artificial components. At times, hip replacement implants can wear out for various reasons and may need to be replaced with the help of a surgical procedure known as revision hip replacement surgery.